Last month's gathering of the Irish Whiskey Society was a celebration of Cooley's flagship single malt, Tyrconnell. That's the unpeated one (Connemara being the turfed-up version). We sampled past, present and possible future versions of the stuff in the company of Cooley's Innovation Manager, Alex Chasko, and Global Brand Ambassador, John Cashman. John provided the history of the brand, which pre-dates Cooley Distillery by a long chalk. Indeed, John told us, Tyrconnell was the biggest-selling Irish whiskey in pre-Prohibition USA (and perhaps the biggest selling whiskey in any category, since Irish whiskey was the liquor of choice back then). Alex, Noel Sweeney and the rest of the Cooley crew have been methodically reviewing and tweaking their various brands in recent years. Connemara, Kilbeggan and Greenore have seen their ranges expanded and adjusted, and now it's Tyrconnell's turn. Sometimes Tyrconnell comes disguised. We can consider any unpeated single malt made at the Riverstown distillery to be part of the Tyrconnell family. This includes the recent Palace Bar whiskey and the Irish Whiskey Society's own Grand Crew and Premier Crew bottlings. Dún Léire is British supermarket, Sainsbury's, own label Irish whiskey. It garnered a lot of attention when Jim Murray's Whiskey Bible named it Irish Whiskey of the Year 2011. Various reports on the IWS forum have backed up that assessment but this was my first opportunity to sample it. At 8 years, it's a bit older than standard Tyrconnell's 6 to 7 years, but it still has a youthful nose. The taste is very satisfying though. Nicely balanced with a little spice for interest. In the head-to-head with the current expression of Tyrconnell it won handily in a show of hands among attendees. I agree with that. There was some debate on the internet when Sainsbury's updated the packaging as to whether the taste had changed too. Our bottle sported the new livery and, according to the Cooley guys, the liquid hasn't changed. So, still a good buy. As an aside, John Cashman called out Avoca from Aldi as a similarly great value blended Irish whiskey. I haven't tried that one. This was the "Whiskey Past" part of the tasting. This was the second release of Tyrconnell and is easily distinguishable from the current release by the 5 stars on the label. It has a weak nose and a weak taste and it didn't find much favour in the room. Only 3 out of 37 rated it the best when compared with the Dún Léire and the current Tyrconnell. This is the current release and it is a significant improvement over the 5 Star. It has lots of vanilla and a little wood on the finish. It's perfectly drinkable on its own. It still noses and tastes a bit young. It doesn't have an age statement but is 6-7 years old. It was originally pitched against Jameson but Jameson is a blend whereas this is a single malt. Cooley already has a strong blend in Kilbeggan so perhaps it's time to place Tyrconnell a little differently. One possibility they are considering is adding an age statement. Given how well the Dún Léire was received, this seems like a smart move to me. There is nothing like this on the market. We already know that Tyrconnell takes a finish well; there have been well-received releases of 10yo madeira-, sherry- and port-finished whiskeys. Rum is a new experiment. Cooley took en ex-bourbon cask (Jack Daniels, I think) that had spent 8 years maturing Jamaican white rum and filled it with aged bourbon-matured malt. (Alex couldn't recall offhand how old this malt was - 5 or 7 years old.) Seven months later, this was the result. It had a very citrusy, orange-zest finish. I liked it. A little rough around the edges though, and could be polished with a couple more years initial maturation. I hope it escapes from the distillery as a product soon. I mentioned the various Tyrconnell finishes above. Tullamore Dew released a "four wood" combination of the madeira-, port- and sherry-finished malts with plain bourbon-matured malt. It wasn't good; a big disappointment given the known quality of the components. This 4 Wood, however, was Alex's own mix. It's a huge improvement over the Tullamore Dew version but it's a curious one. It's like a very crisp, clean version of standard Tyrconnell. The effect of the various finishes seems to have been cancelled out. So, a very decent whiskey but not as exciting on the palate as you might anticipate. Zoltan Vari is a founding member of the Irish Whiskey Society and organised the Tyrconnell night. He also bottled his own cask of Tyrconnell in 2010 and generously contributed one of his rare bottles to the tasting. I've tried this a few times now and it still ranks as the finest Tyrconnell I've tasted. This is about as old as Cooley malt gets and was a sample drawn from one of their early casks. It's up there with the best but the cask has been disturbed regularly for sampling purposes so it perhaps doesn't exactly match a cask that has been resting quietly in the warehouse all these years. 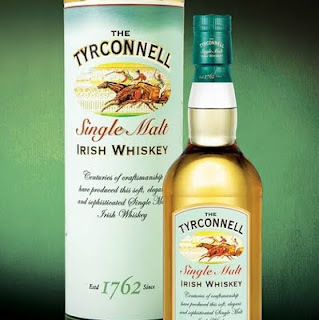 What's very exciting about Tyrconnell is that we still don't know how good this malt can get. It has been steadily improving for two decades now. That said, Alex's main interest is in the area of rum- and wine-finishes (the Celtic Whiskey Shop has proved how spectacular the wine finish can be).